The turnout in the 2018 primary was historic and record-breaking all around. While Republicans increased their total number of votes, the Democratic voter turnout was the most shocking, with 147,000 more voters than in the 2016 presidential primary. Although there was an amazing Democratic voter turnout, the Hispanic vote was lacking and most of the voters helped Garcia’s opponent Steve Farley. 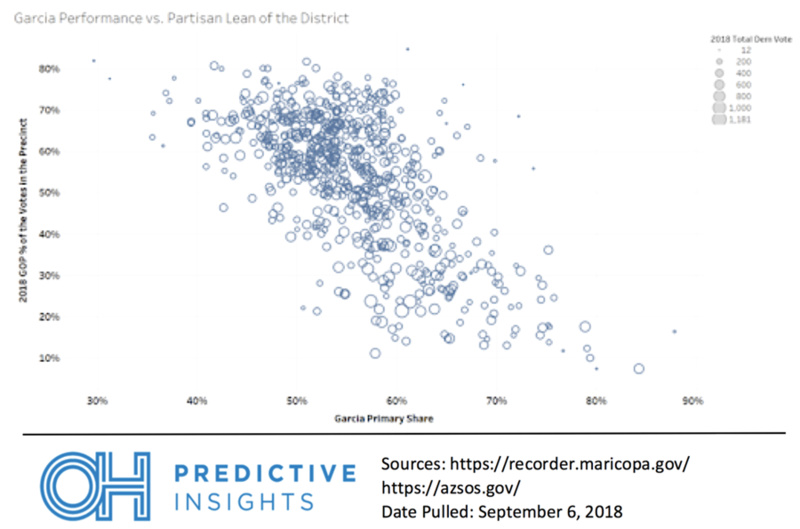 The chart below shows that in Maricopa County, the Garcia primary share was lower where there was an increase in the raw Democratic vote change from 2014 - meaning Garcia is likely not to be given credit for the boom. Pima County, Farley’s home county, saw one of the largest Democratic turnout boosts. Unsurprisingly, Farley performed best there with 44% of the vote, while Garcia only managed to take 39%. Garcia did his best in reliably Democratic areas, a byproduct of his strength in Hispanic areas and his struggles with branching out beyond that. In areas that were more Republican, Garcia consistently received under 60%, or even 50%, of the primary vote, while tending to do better in precincts with larger shares of Democrats. A trend to note is that as Democrats made up a larger share, Garcia received a larger portion of the vote in a linear fashion. 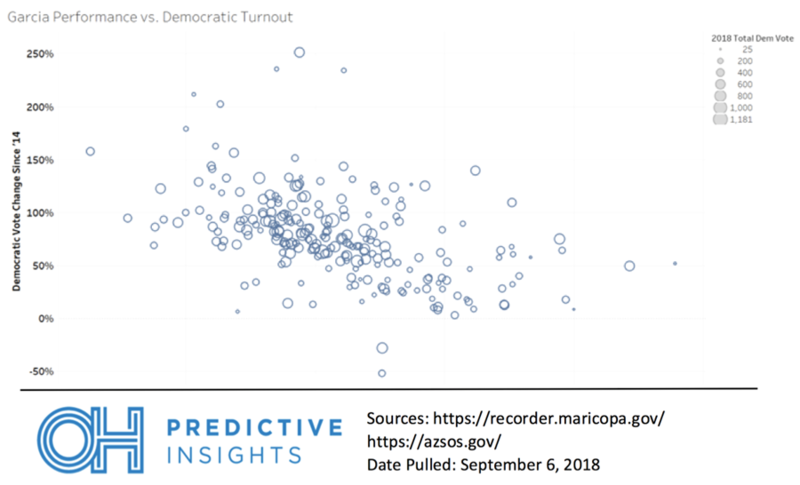 Upon analyzing the Arizona Primary results, one of the most surprising findings was that there was no true relationship between Republican turnout and any of the candidates in the high-profile Senate primary. Instead, the only real effect on the Republican turnout comes from the Secretary of State race. Incumbent Michele Reagan faced a challenger from outsider Steve Gaynor, who spent over $1.5 million on broadcast TV and overtook Reagan to win statewide with close to 70% of the vote. His large amount of primary spending appeared to influence turnout, however. 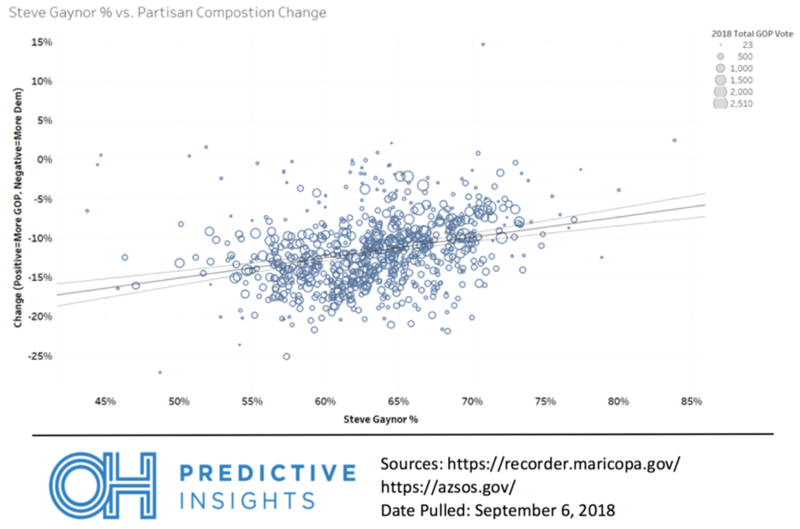 In the graph below of precincts in Maricopa County, we see that as Gaynor’s share of the vote increased, the share of the vote in that precinct did not shift as Democratic in places he did worse. This means that Gaynor was turning out more Republicans, and they were staying home, or Democrats were turning out more people in the places he lagged, a demonstrable turnout impact.